Okay, so first things first – as you may have figured, chaos magic is not exactly reliable – whenever a feature or spell calls for a chaos magic surge, you roll 1d20 – on a 1, a chaos surge occurs, This surge is handled via its own dedicated d%-table, which is a total of 50 entries strong. Some of these duplicate spells (like enlarge on the spell’s target), while others e.g. summon a constrictor snake around your waste (does that mean it starts grappling you? No idea…) or drops a mule on the target. Perhaps, all the target’s hair falls out (dwarves will hate you…) or you become utterly immune to damage for one round. I really like this table, though I do have a number of concerns with it – namely how potentially awkward/detrimental spells cast in addition to existing ones interact with concentration – aforementioned enlarge, for example, is usually a spell governed by concentration…so what if the spell that prompted the surge has no concentration? How long does it last? At what spell level is moonbeam cast via chaotic surge? I assume base level, but triggering spell level may also make sense… one entry makes a weapon in sight temporarily magical. Okay. Does that mean +1 to attack and damage rolls? I assume not, but you could also make a case for it, since e.g. the monk’s ki-empowered strikes employ a different wording structure. In short: I like the metrics here – chaos magic will happen sooner or later, but probably not all the time. The respective entries of the table, though, could use some clarification in a number of entries. Unfortunately, this constitutes a flaw in the very foundation of the magic tradition. Class option-wise, we get a wizard school for adherents of chaos: At 2nd level, the gold and time to copy a chaos spell are halved and as a bonus action, you can grant yourself or a creature within sight (as a reaction) advantage on one attack roll, saving throw or ability check “that will be made this turn.” This causes a chaos surge. Oh boy. So, is it intentional that RAW, you can use a reaction to help an ally in a save, but not yourself (you’re locked into bonus action use)? “Will be made” implies that you must use this feature BEFORE the check in question is made, but the rules do not properly codify that. I have no idea how this is supposed to work. The feature requires a long rest to recharge, just fyi. Starting at 6th level, you may choose to have damaging spells infused with chaos – you may do so after determining whether you have hit, but before determining damage. You roll 1d6 +1 and this is the maximum number of damage die of the spell that you can reroll. Additionally, damage is changed randomly to one of 10 non-physical damage types. This causes a chaos surge and needs a long rest to use again. Okay, so big question: What about spells that do not require an attack roll? Can you use this feature with them? Do you have to announce its use before saving throws are made? What about spells that require attack roll and saving throw? The feature states “You make this choice after determining whether the spell has been successful (i.e. after making a spell attack roll)” –so I *assume* that any spell that “hits” constitutes a successful spell. Still, rules-language-wise, this could and should be cleaner. 10th level nets you random resistance to one damage type drawn from the same aforementioned table for 1 + Intelligence modifier min 1) rounds; if you choose to invoke a chaos surge when using this feature, you can roll twice and choose the resistance gained. Once again, long rest to use again. The 14th level ability represents a huge power-boost there – suddenly, you regain one use of one of the aforementioned features without needing to rest when casting a chaos spell, and you gain temporary hit points when casting such a spell. The pdf also contains a bardic college, the college of entropy, which nets you “proficiency with Acrobatics, Athletics, and a gaming set of your choice.” I assume that means you get proficiency in the gaming set, but frankly, it could be read as only gaining the set. Starting at 3rd level, you gain luck stealer, which lets you use your reaction when a creature within 60 ft. makes an attack roll, ability check or saving throw with advantage: This expends bardic inspiration to impose a penalty to the roll equal to your bardic inspiration die. You gain Inspiration, only usable on yourself, which lasts for a number of rounds equal to the die rolled. This causes a chaos magic surge. Cool ability! 6th level yields one Bardic Inspiration as well as a chaos surge whenever you cast a chaos spell. This can only be used once before requiring a short or long rest to recharge. 14th level, as an action, allows you to change one prepared spell for another one of the same level or lower, returning the spell to normal after one turn. This causes a chaos magic surge. It should be noted that both class options delimit otherwise limited options – while not problematic as presented, as far as future-proofing is concerned, GMs should be a bit careful with these. Okay, so those would be the class options. The spells note the suitable classes in brackets after the respective spell level, just fyi. A total of 17 spells are provided. For first level, we begin with auspicious warning, which can be cast as a reaction to add a surge-like d4 as a boost to atk, a save or an ability check. While it is clear how the spell is intended to work, the casting time formatting is not correct: The spell does not specify the conditions of the reaction taken in the casting time section – a glitch that btw. extends to ill-fated word, which represents the debuff-mirror to this spell. Undermine armor decreases the target creature’s AC by 2 on a failed save, affecting only proper armor – so no natural armor subversion. There are 4 2nd level spells – bad timing imposes disadvantage on the next attack roll or ability check on a failed save. Chaotic vitality requires a melee spell attack against a creature with HD no greater than yours and at least 1 hp. (Nice kitten-proof!). You total your and the creature’s hit points and roll a d% – both you and the creature gain new hit point totals: From a 1% to be set to 0 hp to a 1% chance of getting 200% and haste, the effects run a nice gamut and contain temporary hit points for the caster; as a whole, not cheesable. One problem: The spell is instantaneous, so how long does the haste effect of the best result last? Frenzied bolt causes 3d8 damage of a randomly determined energy type (which is pretty cool) – but the spell is somewhat risky: On an odd attack roll (50%) rolled, it targets the next legal target, potentially affecting your allies or yourself! With massive range of 120 ft., this can be a brutal mook-sweeper. That being said, while it is evident from context, I think the rules-language would be smoother if the feature specified that it requires a ranged spell attack before mentioning that it requires new rolls for subsequent attacks. Shifting the odds makes your next attack or ability check have advantage, but imposes disadvantage on the attack roll or ability check, whichever happens first, thereafter. At 3rd spell level, the ritual surge dampener allows you to protect one creature from chaos surges, allowing the creature a save against it, even if the surge would not allow for a save, or it gains advantage when a save would be allowed. Okay. So what’s the save DC in such a case? The benefits discharge upon being used, fyi. The 5th level spell is the mass version of this ritual. Entropic damage field is very, very strong: It freely disperses damage you take evenly among all creatures that fail a Charisma saving throw within 60 ft., and a creature that makes the save ends the spell’s effect for her. Personally, I think this should have a fixed number of creatures affected. Otherwise, this can be cheesed. Also: You don’t have to see the creatures – the spell could be used to kill off targets behind barriers, hidden foes, etc. Calm of the storm lets you negate the effects of a chaos surge. It should be noted that the “At Higher Levels.”-headers have not been properly italicized. 4th level comes with 3 spells: Chaotic form provides a buff that halves creature speed, but nets the target advantage on Dexterity (Acrobatics) and the ability to pass through difficult terrain unimpeded as well as the option to squeeze through tight spaces. Fluctuating alignment changes the target’s alignment randomly on a failed save, changing every minute while the spell persists. I *assume* that this affects only a single target, but I’m not sure – the spell doesn’t specify its targets. Wild shield lets you spend a reaction to absorb a spell targeting you or including you in the affected area; absorbing a spell thus makes you cast a chaos surge and the spell ends upon absorbing 4 spell levels; trying to absorb more potent spells requires an ability check – on a failure, the spell takes place regardless, alongside a chaos surge. The 6th level spell included would be chaotic world, which renders the targets blinded, deafened and prone on a failed save. Personally, I think the spell should allow for saving throws on subsequent rounds. 7th level’s ritual is the most complex spell herein, uncontrollable transformation: You either roll 1d10 and gain a random mutation from a table, or roll 1d10 two times and choose, but when you do, roll twice, you incur one level of exhaustion. Higher level spell slots yield more mutations that require extra rolls and can make you incur more exhaustion, if you try to control them. The benefits are potent and interesting. Finally, the highest level spell herein would be 8th level’s paragon of chaos, which nets resistance to all physical damage types and immunity to exhaustion, paralysis, petrification, poisoned and unconscious –RAW not poison damage though! You may also teleport as a move and gain truesight 30 ft. You can also, as a bonus action, create a chaos surge each round – using either yourself or another creature as the “caster” of the surge. Problem: The ability to do so LACKS A RANGE. RAW, you can choose any creature you’d like; you don’t even need to see the target. Editing and formatting, on a formal level, are pretty good; on a rules-language level, there are quite a lot issues in the details herein; more so than what I’m accustomed to see from the series and Kobold Press. Layout adheres to a 2-column full-color standard and the pdf sports gorgeous full-color artworks. The pdf comes with basic bookmarks, for chapter headers, but not for individual spells. 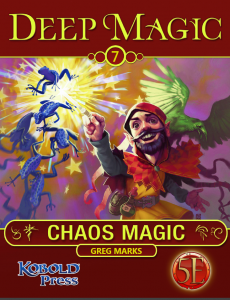 Greg Marks’ chaos magic per se is a damn cool school; the chaos surge mechanics are interesting and evocative; what the pdf does with them, however, is significantly less impressive. The spells contained herein could do more with this unique set-up; similarly, there are some wonky bits in the very basics of the rules for the magic type, as well as in the details of some spells. These glitches, alas, influence rules-integrity…and that is not something I can ignore. This is not bad, mind you -if you’re willing to exert some GM-decision-making, then this will provide some fun at the table. Still, I wish the rules were slightly tighter and that they embraced the cool chaos ideas more thoroughly. Ultimately, this is a quintessential mixed bag for me. My final verdict will clock in at 3.5 stars, rounded down for the purpose of this platform.